Bayern Munich are waiting on the full extent of an ankle injury sustained by Bastian Schweinsteiger ahead Wednesday's DFB-Pokal quarter-final clash against Bayer Leverkusen. The veteran Germany captain hobbled out of Saturday's 1-0 win at Borussia Dortmund which kept the Bavarians 10-points clear at the top of the Bundesliga and on course for a third consecutive domestic title. Head coach Pep Guardiola is already without David Alaba, Netherlands flyer Arjen Robben and France forward Franck Ribery because of injuries, although the club said they do not expect World Cup winning midfielder Schweinsteiger to be the victim of another long injury lay-off. The 30-year-old schemer missed the entire first half of the Bundesliga campaign because of a knee injury following his exploits in Brazil and is not expected to feature at the BayArena. 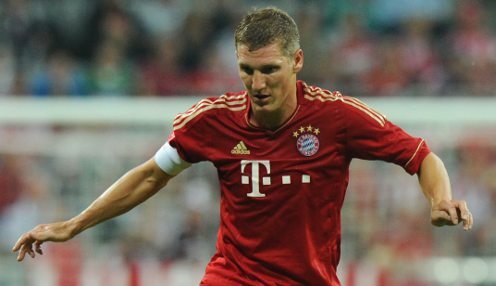 "It won't be a big problem, 'Basti' is a tough old dog," Bayern's director of sport Matthias Sammer told broadcaster ZDF. "We are hoping it'll be done and dusted in a day or two." Guardiola's all-conquering side head to North Rhine-Westphalia hoping to keep alive their hopes of repeating the 2013 treble of German league, cup and Champions League titles. Midfield lynchpin Schweinsteiger may well be rested so that he is fit for the club's Champions League quarter-final, first-leg, clash away to Portuguese giants FC Porto on 15th April. Bayern Munich are bidding to win the German Cup for a record 18th time with the final to be held at Berlin's Olympic Stadium on 27th May. They can be backed at 1/1 to win this season's Champions League.